Sour Mix lollies will satisfy your tangy taste buds and also when you want a choice. This is a random mix of Sour Ears, Chunky Clouds and Chunky Pigs. Sour Worms, Sour Cola Bottles as well as Sour Hearts. 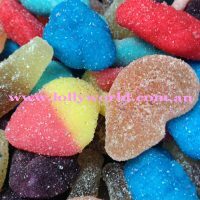 *Mix varies depending on availability of lollies.